A Masterly Account – a new history of the Battle of the Falkland Islands. The Battle of the Falklands 1914. By Graham Pascoe. Reviewed by David Tatham. Copies available from the Secretary, the Falkland Islands Association, care of Falkland House, 14 Broadway, London, SW1 H 0BH. Price (with UK postage) £10. 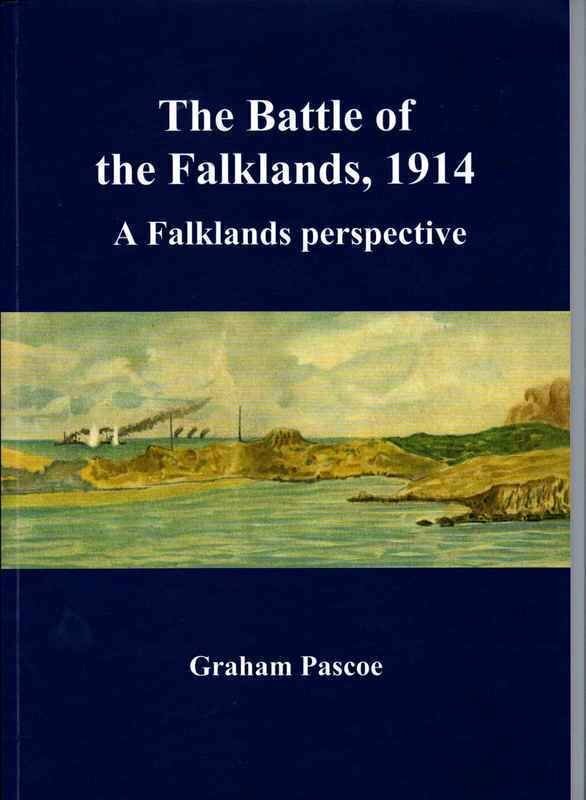 With the centenary of the 1914 naval battle coming up in December and commemorations planned for Stanley and London, Graham Pascoe’s concise account of the battles of Coronel and the Falkland Islands is well timed. Pascoe, who together with Peter Pepper is working on a comprehensive history of the Islands (The Falklands Saga) and a shorter version (A Brief History of the Falkland Islands), has extracted his account of the events of November and December 1914 and produced a short generously illustrated book of 60 pages. He describes the book as “A Falklands Perspective” and indeed it gives local background and stories in a way that none of the previous histories have managed, merging local incidents with the high strategies of the British and German fleets. The author is uniquely well suited to his task – not only does he know the Falklands background from his research and his visit to the Islands, but he has a complete mastery of German, living in Bavaria and being a professional trainer of interpreters. More than this, Pascoe is a historian of daunting accuracy and exactitude. He has studied all the sources, compared the various editions and checked translations against originals (revealing some striking differences). He is well-versed on naval procedures, on navigation and on such arcane topics as the Coriolis effect and its possible impact on British gunnery. His narrative begins with the placid background of Stanley before the outbreak of war and a complacent New Year’s editorial in the monthly Falkland Islands Magazine (FIM). Pascoe recalls the routine visit of HMS Glasgow to Stanley early in 1912 – a round of matches – football and shooting – concerts and services in the Cathedral. Glasgow was an extremely happy ship and, more unusually, with a very temperate crew. Against this, Pascoe discovers an ominous article in the FIM dated March 1914 and asking “…what of the Falklands should war break out?” As indeed, five months later, it did. The FIM is one of his main sources for the Falklands perspective, together with a vivid description which Governor Allardyce wrote for the Colonial Office of the months from August to December 1914. But in addition there are letters from ordinary Islanders evacuated from Stanley to camp (the countryside) packed onto the SS Falkland when invasion threatened. Pascoe is equally sure-footed in describing the movements of the German fleet under Count von Spee and its encounter at Coronel off the coast of Chile with the British squadron of Admiral Sir Christopher Cradock, which was weaker in ships, less experienced and less skilfully led. Cradock was roundly defeated in the most serious British reverse at sea for a century. Two British warships were sunk with all hands, including Cradock himself. When news reached the Falklands the colony was close to despair. It was saved by the decision of Winston Churchill (then First Lord of the Admiralty) to detach two heavily armed and fast battle cruisers under Admiral Sturdee to the Falklands to enable the Royal Navy to confront von Spee. Even so, Pascoe makes it clear how narrowly the almost undefended colony escaped a German landing. Both fleets dawdled as they approached the Islands in the first days of December: “but it was the Falklands’ good luck” to quote Pascoe “that at the vital moment, von Spee out-dawdled Sturdee”. So the British battlecruisers arrived less than a day before von Spee – effectively trapping him. The battle itself is well described: there is a wealth of British sources and the senior surviving German officer, Hans Pochhammer left a graphic account of the action, of the sinking of his ship the Gneisenau and of his civilised treatment by his British captors. (Pascoe has freshly translated the extracts from Pochhammer’s book). From the Falklands viewpoint, it is made very clear which German ships were spotted by Christian Andreasen on Sapper Hill and which were reported by Mrs Felton and her maid Christina Goss from Fitzroy. The site where Canopus was beached and secured to provide a firm firing position is also convincingly identified. The sole German warship to survive the battle, the Dresden, made for the coast of Chile and for three months played hide and seek with the Royal Navy in the fjords until she was cornered and sunk by Glasgow and Kent. The threat to the Islands was over. I have applauded Pascoe’s scholarship: with it goes a sardonic sense of humour which I found refreshing. He demolishes various myths built around the events of 1914, usually by Malvinas-obsessed Argentine writers. One “absurd and totally untrue theory” is debunked at length in case its author (in fairness, not an Argentine) is tempted to publicise it during this centenary year! But this scholarship carries a heavy cargo of footnotes – the average reader may be put off by a page which is up to two-thirds composed of footnote, as several are. It would perhaps have been better to concentrate the references and comments as end-notes following the narrative. A few small niggles. I have mentioned the generous provision of illustrations, all with full and careful captions which add to their value. It is not the author’s fault that many of the photographs are out of focus as they were taken by amateurs, literally in the heat of battle. But I did long for a sharp photograph of the battlecruisers say, or HMS Canopus, to enable me to appreciate their size and their armament. It would too have been good to see some of the German paintings which attempted to mythologise the battle. Pascoe mentions Willy Stoewer’s painting of Dresden with her prize the Conway Castle; there is also Hans Bohrdt’s propagandist painting “The Last Man”, reproduced in Stanley Museum, with a sailor clinging to wreckage and cheering on German reinforcements. A map of the Chilean coast would have been helpful, not just for the battle of Coronel but to illustrate von Spee’s slow progress towards the Falklands and indeed Dresden’s movements in early 1915. Finally a little more on the Battle Memorial in Stanley, which after all is the prime commemoration of the Battle and the site of the annual parade, would have been interesting: surely it is only fair to mention the sculptor (Frank Ransom) and the fact that the initiative for its construction came from the Falkland Islands Company, which largely paid the bills. But these are minor quibbles. This book cannot be beaten as a clear professional and readable account of the two battles in which the Falklands first briefly appeared on the world stage. Graham Pascoe is better placed than anyone to give us the Falklands perspective on these events and this he has done with flying colours.